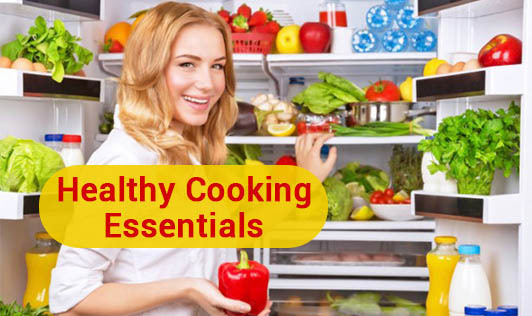 If you want to cook healthy, stay fit, lose weight, and eat healthy, there are some important points that you might have to follow. Before starting to cook healthy, keep these things in mind. 1. A meat thermometer: it is important to check the internal temperature of the meat. This decides if you are cooking a healthy or a stale piece of meat which may look fresh. 2. Different colour cut boards: Use different cut boards for meat, vegetables and fruits. Always clean and dry the cut boards for the next use. Using wooden cutting boards may be better as it's possible for bacteria to get in the crevices of plastic cutting boards. 3. Measuring cups and spoons: This will ensure that you do not end up eating more than the required amount of food and calories. This is very helpful during a weight loss plan or when you plan to start eating healthy. 4. Herbs and spices: This will just boost the taste of the food and not the calories. Spices like cinnamon, cardamom and Italian seasonings can add wonderful flavours to your salad and can make you food more interesting. 5. Food weighing scale: This will help to check the cooked weight of the food such as sabzi, parata, salads etc. If you are really interested, you could even calculate the amounts of nutrients such as calcium, iron etc. in your food. 6. Anti bacterial sanitizer: This can avoid any type of cross contamination in your kitchen by ensuring good hygiene standards. The above tips might seem like as if you are following it daily, but bringing them to practice on a daily basis can make a huge difference!